A few weeks ago Bon Appetit posted Roasted Sweet Potatoes with Miso Tahini Sauce on Instagram and I became obsessed with making a bowl around the sauce. Before I even tried it, I knew I would love it! Mission accomplished…. 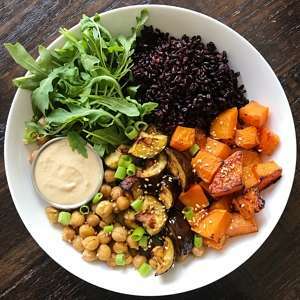 Sweet potatoes, eggplant, black rice, arugula, miso chickpeas, and a savory and highly addictive, 3 ingredient sauce (miso, tahini, vinegar), from Bon Appetit. It couldn’t be easier, more flavorful or more satisfying. I also made Teriyaki Chicken and some roasted potatoes so we are headed into the week with a stocked fridge that can be used to make lunches or dinners over the next few days. It sounds like a lot but all the veggies roast at once, the tahini sauce takes mere minutes to mix up, the rice simmered on the stove while the veggies roast and the outdoor grill is up and running for the chicken. Once you make it a habit of batch cooking, it becomes quite quick. Simple, satisfying and packed with flavor! Miso Tahini Sauce recipe from Bon Appetit. 2-4 Sweet potatoes (depending on size), cubed or 1 container pre-cubed Sweet Potatoes or Butternut Squash. I peeled skin here but would be equally delicious with skin left on. Preheat oven to 400°F and line 3 baking sheets with parchment paper. Toss sweet potatoes in olive oil and arrange in a single layer on baking sheet. Sprinkle with kosher salt. Bake 30 minutes or until tender. For more crispy squash, bake a bit longer. Set aside. Toss eggplant with olive oil and place in single layer on baking sheet. Sprinkle with salt and pepper. Bake for 30 minutes, or until crispy. Set Aside. Chickpeas: In a small bowl, mix oil, miso and tamari if using. Toss chickpeas to coat. Place in a single layer on baking sheet. Bake 15-30 minutes depending on how crispy you want them. Set Aside.